Oh I love that black Nzeppel. Indeed I do. Are you saying those lines are not gold, but done with bleach? 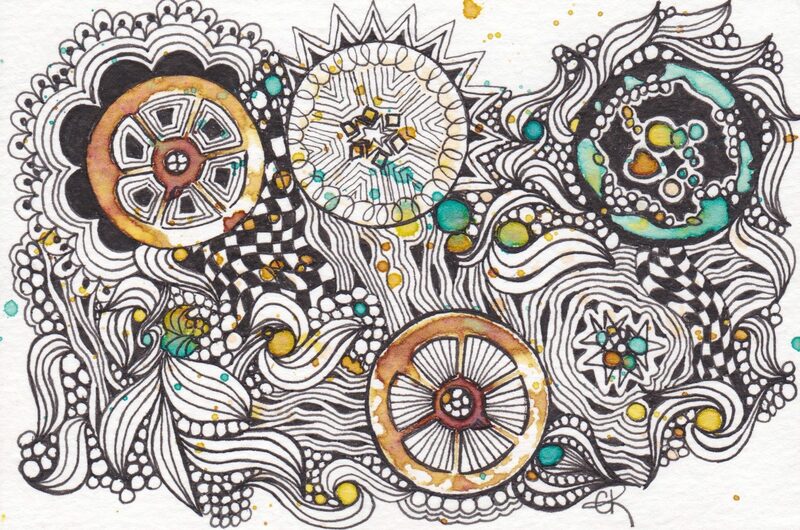 I also love the dotty mandala or zendala. Great work!!! It is all bleach. No ink was involved. don’t use anything metal…it will ruin your nibs (and dig into the paper too much.) I used bamboo skewers. I dulled one down to make a broader nib too. Fascinating study in black. Hard to believe that no gold was applied to these gorgeous pieces! What a cool idea! I’ve used bleach pens on t-shirts and it’s often a surprise what colour the bleached area is, but never thought to use it on paper….. love your ‘NZeppel tile! Different way to make patterns. I like the bronze look of the ‘Nzeppel.